Incorporating an elegant and timeless (pun intended!) 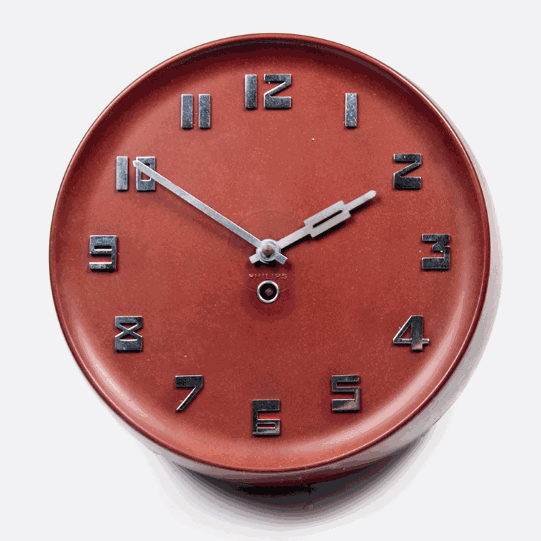 Art Deco wall clock is an easy way to achieve a Deco-inspired room. There are countless reproductions available at local retailers, but don't fret - if you're after an original timepiece, scope out the antique shops, vintage auctions and eBay. They are available, if you're willing to pay a premium. Well worth it, in my opinion. Inlaid wood was a major trend during the days of Deco and very easily expressed in clock form. Also, look for clocks with marquetry detailing, high gloss veneer or exotic woods like ebony or mahogany. The classic Art Deco colours to look out for are; peacock blue, canary yellow, brilliant red, emerald green and royal purple. Rich jewel tones or bright primaries are your best bet. A black and white motif will do as well as it achieves a very streamlined, modern aesthetic which was popular in the 1920's and 1930's and looks just as fresh today. Choose a clock made from steel, chrome, silver, gold or bronze This look is ultra-futuristic and goes well with virtually any decor. Another major trend was the use of sharp angles and geometric patterns like zigzags, triangles and chevrons. The round face of a clock was most conducive to the sunburst motif This design should be very easy to find.